Wishing all all who celebrate, a fabulous Happy Thanksgiving. May you treasure time with friends and/or family. While I won't be with my entire family tomorrow, I will be with my adorable grandson Leo, my younger daughter, SIL, and their family. I know it will be a fabulous day! Enjoy the day, eat as healthy as you can and you'll be happier the next day...but enjoy whatever it is you decide to eat...JOY and gratitude are most important tomorrow!! There is no room for guilt. Besides, it won't change anything. Decide ahead of time what you plan to eat and then let it go. I give thanks to my friends and loved ones, near and far and send love to all of the amazing people in my life that are no longer with us. I know they will be with us in spirit. Blessings!!!! 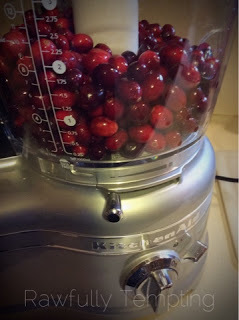 In food processor, pulse chop cranberries until well processed. Do not over process. Transfer to a large bowl. Rough chop apples and pulse process, leaving somewhat chunky for texture. 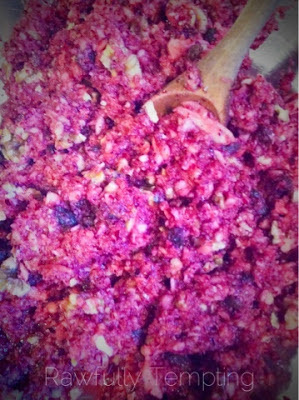 Add to bowl with cranberries and mix. Add rind from half of orange. Add juice from orange. Add maple syrup or *Your Favorite Sweetener and stir in raisins and walnuts. Store in airtight glass container or ball jar in refrigerator. For best results, make 2 days in advance.